In the family of disorders such as epidermoid cyst and glottic sulcus[/intlink]. 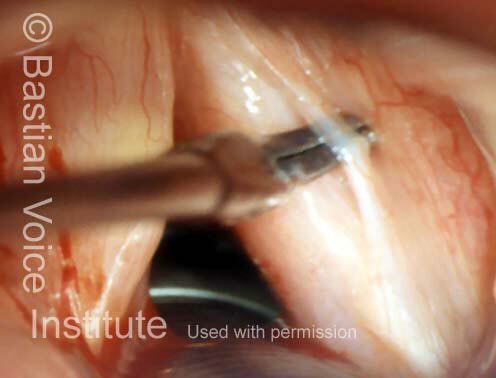 Imagine a cyst that opens in two places, spilling its contents completely. The result is a narrow bridge of mucosa, attached anteriorly and posteriorly, known as the mucosal bridge. Severe vibratory injury in fitness instructor who is dynamic and extremely intense and "vocal" by nature. Click to enlarge this photo to better see tiny dotted lines that outline the mucosal bridge on each side. The bridges is extraordinarily slender on the right (left of photo). 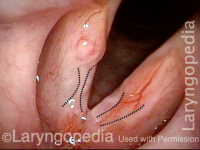 Now viewed under narrow band light, the bridges are a little more easily seen, and they overlie non-mucosalized granulation tissue on the vocal ligament. A single asterisk is on the midpoint of each bridge. Under strobe light, open phase of vibration at D4 (293.66Hz). Closed phase, at approximately the same pitch.